There are numerous advantages to welcoming foreign direct investment (FDI). At first blush, Canada seems to be doing reasonably well – though not as well as it used to – as a destination for FDI. Between 2010 and 2013, it ranked ninth globally on the list of destinations for FDI. 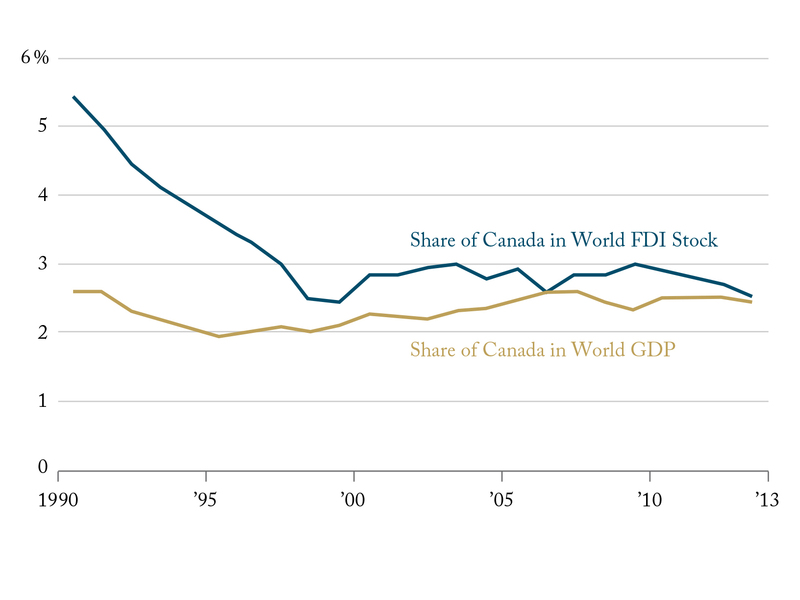 Further, as this Intelligence Chart shows, Canada’s share of global FDI stocks is still slightly higher than its weight in the world economy. Some have even placed Canada at an all-time-high third position, behind the United States and China. In recent years, however, FDI in Canada has grown significantly more dependent on oil and gas and related investments. Other sectors, notably direct investments in manufacturing, have correspondingly declined significantly. The sharp decline in oil prices since mid-2014 means that Canada should pay more attention to the range of factors that might make it more or less attractive than competitors as an FDI destination, across a range of sectors.